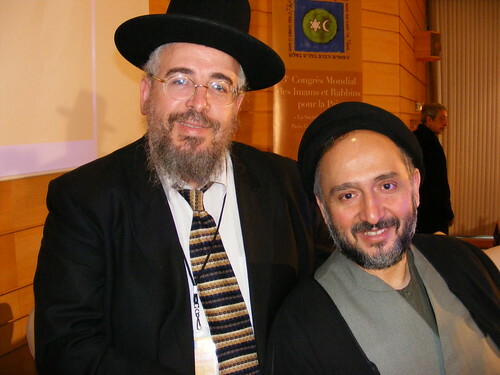 The Third World Congress of Imams and Rabbis for Peace took place December 16-17, 2008 in Paris, France. Imams and Rabbis came from all over the world to bring the voice of Judaism and Islam to build bridges of dialogue and help solve conflicts motivated by religion in the Middle East, Europe, and the world. This year was expanded to include Christians. There were meetings and talks, and in the evenings the music of the band Andalucia, who have mutual Jewish and Islamic heritages, brought people closer together. Religious dignitaries, Imams and Rabbis, together with Christians and other religious experts from around the world met to defend the sacred character of peace. Their aim is to voice the common view of Islam and Judaism, and create a joint monitoring group to support, develop, and propagate initiatives that encourage peaceful coexistence and dialogue. An Israeli Rabbi and an Iranian Iman. The Congress brought together 85 religious leaders and experts from over 22 countries. Participants included the President of the Republic of Senegal, who was also the Chairman of the 11th Session of the Islamic Summit Conference. After being elected President of Senegal in 2000, His Excellency Abdoulaye Wade implemented noble ideas for unity and peace in West Africa and for sustainable development. A Rabbi chanting in Arabic to Islamic music. The Congress was organized by the UNESCO Division for Cultural Policies and Intercultural Dialogue in cooperation with the Hommes de Parole Foundation.